The dimer of SF2: small is beautiful (and weird). To achieve this, it is important that scientific research be open and transparent. Openly available research data is central to achieving this. It is estimated that less than 20% of the data collected in chemistry is made available in any open manner. But it’s not all hot air, honestly. Peter Murray-Rust and I had started out on a journey to improve reproducibility, openness and transparency in (inter alia) scientific publishing in 1994. In 2001 we published an example of a data-rich article based on CML, and by 2004 the concept had evolved into something Peter termed a datument. Some forty such have now been crafted. In 2009, the journal Nature Chemistry was starting up, and I approached them with the idea of an interactive data exploratorium on the premise that a new journal might be receptive to new ways of presenting science. It was accepted and published and was followed in 2010 by a second variation. In both cases, these activated-figures were sent to the journal as part of the submission process, and hosted by them (they still are). You can even access them without a subscription to the journal! Move on to 2012, when David Scheschkewitz had some very exciting silicon chemistry to report, we collaborated on some computational modelling, and sent the resulting article to Nature Chemistry for publication. This included the usual interactive table reporting the modelling and its data. However, it transpired that the production workflows for Nature Chemistry had been streamlined and I was informed that interactive tables could no longer be accepted. This time, we (i.e. the authors) would have to solve the issue of how to host and present the data ourselves. The table should be immediately accessible by non-experts, but not through any convoluted processes of downloading a file, expanding it and finding the correct document within the resulting fileset to view in the correct program, which is how normal ESI is handled. The table and the data it contained within should be capable of acting as a scientific tool, forming what could be the starting point for a new investigation if appropriate. The data itself can have two layers, presentation ¶ using a combination of software (Jmol or JSmol for chemistry) which are used to invoke the “raw” data. That data itself is citable (this is just a single example, resident as it happens on a different repository). The reader can choose use just the presentation layer or the underlying data. The data object can be embedded in other pages; here it is below. The data sources for this table are themselves citable. Each of the components is held in an environment optimised for it and so can be presented to full advantage. The conventional narrative publisher does not necessarily also have to develop their own infrastructures for handling the data. They can choose to devolve that task to a “data publisher”. 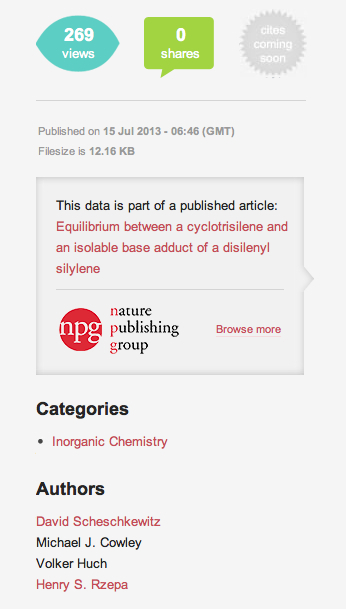 The data publisher (Figshare in this case) makes the data open. One does not need an institutional subscription to access it. “Added value” for each component can be done separately. Thus most narrative publishers would not necessarily wish to develop infrastructures for validating it or subsequently mining such “big data”. Indeed data mining of journals is prohibited by many publishers; it simply is either not possible or rendered so administratively difficult as to be impractical. Whilst a narrative article must clearly exist as a single instance (otherwise the authors would be accused of plagiarism), data can have multiple instances. Indeed, there exist protocols (SWORD) for moving data from one repository to another as the need arises. Publishing the same data in two or more locations is not currently considered plagiarism! The data component can be published as part of an article or say as part of a PhD thesis. This way, the creator of the data gets the advantages not of a date stamp associated with a narrative citation but of a much earlier stamp associated more closely with the actual creation of the data. That could easily and usefully resolve many disputes about who discovered what first, leaving the other issue of who interpreted what first to the narrative. I should mention that it is perfectly possible to “embargo” the data deposition so that it only becomes public when the narrative does (although you may choose not to do this). A data deposition cannot be modified, but a new version (which bidirectionally links back to the old one) can be published if say more data is collected at a future date. A whole infrastructure devoted just to enhancing the cited data can evolve; one that is unlikely to do so if the narrative publishers are the only stakeholders. For example, synthetic procedural data can be tagged using the excellent chemical tagger. It is relatively simple (=cheap) to build a pre-processor for publishing data, which for a research student can act as an electronic laboratory notebook, holding meta-data about the deposited/published data and the handles (doi) associated with each deposition. I have been using such an environment now for about seven years as the e-notebook for this blog for example. Thus the task of preparing figures and tables for a publication (or a blog post) is greatly facilitated. The same system is also used by research students and undergraduates for their lab work. I have noted previously how e.g. Google Scholar identifies data citations along with article citations in constructing an individual research profile. A researcher could become known for their published data as well as their published narratives. Indeed, it seems likely that the person who acquires and publishes the data, i.e. the research student, would then get accolades directly rather them all accruing to their supervisor. But what can you, gentle reader of this blog, do to help? Well, ask if your institution already has, or plans to create a data repository. It can be local (we use DSpace) or “in-the-cloud” (e.g. Figshare). If not, ask why not! And if you are planning to submit an article for publication in the near future, ponder how you might better share its data. †The example given at the start of this post contains only one table processed in this manner; the actual synthetic procedures are still held in more conventional SI. *This blog uses the excellent Kcite plugin to manage citations. ¶The good folks at Figshare were extremely helpful in converting this deposition into an interactive presentation. Thanks guys! This entry was posted on Sunday, September 15th, 2013 at 6:01 pm and is filed under Chemical IT, Interesting chemistry. You can follow any responses to this entry through the RSS 2.0 feed. You can leave a response, or trackback from your own site. I include here a shot of the Figshare page for the data noted above, illustrating how the data back-cites the narrative. Can you ellaborate a bit on how the data are loaded? Is figshare hosting the molecule files, the Jmol applet files? There are two ways of uploading data. 1. Using Figshare’s own app (and here you can drag-n-drop multiple files if you wish). These files are not subjected to any analysis or validation; they are just flat files, and they can be in any format. The user then has to supply all the tags/metadata to go with these files, but again there is no check that the metadata actually is relevant to the files. 2. Using the Figshare API (which in part was produced because users like us really pressed for it), one can build a front-end (in our case using PHP) which can perform some of the logic missing from mechanism 1 above. This front end for us in fact started as a system to submit jobs to an HPC queue, and to collect the outputs. These outputs are then scripted to run through e.g. OpenBabel (and we are also thinking of putting them through the CDK), an operation which automatically generates lots of directly relevant metadata and validation. It also creates CML files. This front end then collects all the various outputs and metadata and produces a so-called fileset, which using the Figshare (or indeed DSpace) APIs, is injected into the repository. This last operation therefore boils down to a single click of a publish button (initially as a private deposition, viewable only by enrolled collaborators, and then after a second click, it is made public to be viewable by all). We then branched out to create a slightly separate PHP-scripted environment which does not initially submit to an HPC queue. This is now used to upload other types of data, such as spectroscopy and crystallography. Here, metadata has to be generated by trawling through all the uploaded files looking for anything that OpenBabel can convert into an InChI identifier. Mimimally, that source can be e.g. a ChemDraw file. Some more examples of this can be found in my talk on the topic. We are about to try a new way of doing it, whereby in essence a simple JSmol template is uploaded, and it is then populated by directly referencing the Fighare doi. It is our hope that in the “load file” JSmol command, it can in fact be simply “load doi?identifier” where the doi suffix ?identifier resolves to a local path on the Figshare repository, and retrieves the file directly from there. This has the exciting prospect that this template can then be directly produced by e.g. JSmol itself using the “export to web” feature, and that depositions such as http://doi.org/10.6084/m9.figshare.744825 could be largely automated. Any help that the “Jmol community” could give to this last project would be of course enormously appreciated. I hope that we might have a demonstrator ready in a week or so, but it will still be far from a “finished product”. As you can see, it is my hope that once the above is made easy to achieve, the standard PhD thesis or research article can simply transclude (re-use) such objects as required, and then focus only on the narrative. The Royal Society of Chemistry has issued a press release in which they announce their intention to offer, inter alia, a data repository of their own. The momentum is certainly gathering pace! A two-publisher model for the scientific article: narrative+shared data. is licensed by Henry Rzepa under a Creative Commons Attribution-Noncommercial-Share Alike 3.0 United States License.